Want to make a difference on your file folders? There’s a simple Nautilus, Caja, Nemo extension called “Folder-Color” that allows to change the color or emblem of a folder, or set the global folder color from context menu. 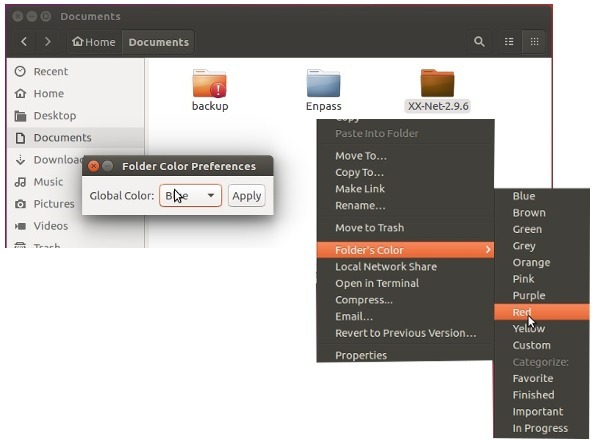 For Ubuntu 16.04, the tool has been made into the universe repository, but it only allows to change the color of folder icons. Apply changes by running command nautilus -q or caja -q. For full feature version that changes the color or emblem and global folder color, use the developer’s PPA. Also restart your file browser via command nautilus -q or caja -q.